The Old Foodie: A Rabbit in the Larder. The packed lunch theme continues for today, with advice from the wartime Ministry of Food in Britain. Rationing remained in force in Britain for years after WW II, and the Ministry continued to put out its weekly Food Facts leaflets until well into the 1950’s. 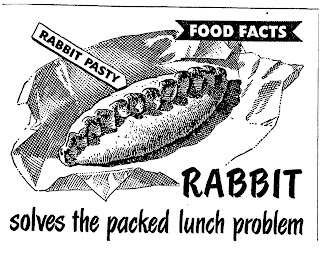 The leaflet went on to give recipes for Devilled Rabbit, Rabbit Paste, Rabbit Loaf, and the following nice idea for a pasty – surely a nice treat to find in the lunchbox, whatever the era. Ingredients: Pastry using 6 to8 oz. flour; 8 oz. cooked rabbit, chopped; 4 oz. grated raw potato; 1 hard boiled egg, chopped; 1 tomato, skinned and chopped; salt and pepper to taste; 2 tablespoons of stock or milk. Method: Divide the pastry into four and roll each piece into a circle about the size of a saucer. Mix all the other ingredients and divide the mixture between the pastry rounds. Damp the edges of the pastry and fold into pasty shapes. Bake in a hot oven 25-30 minutes. Luncheon: as much food as one's hand can hold.